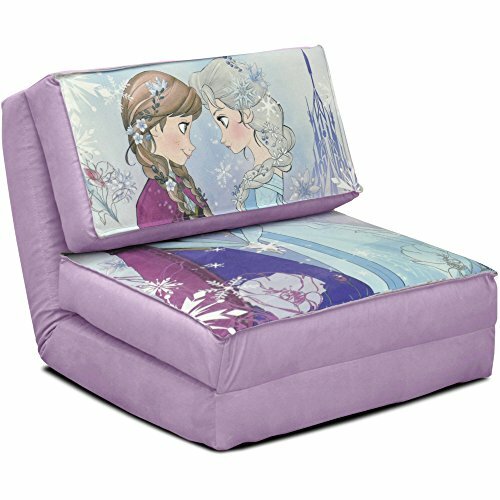 Whether your kids are studying, hanging out with friends or just lounging around, they can experience ultimate comfort and relaxation with this Disney Frozen Anna and Elsa Flip Chair. Made from plush ultra-suede, this flip chair is super-comfortable and is easy to spot-clean for simple maintenance. The three convertible positions make it perfect for small spaces, sleepovers and hangouts. You can unfold it into a bed with a pillow for guests, fold it up into a cozy chair, or use it as a reclining lounge chair. If you have any questions about this product by Dis, contact us by completing and submitting the form below. If you are looking for a specif part number, please include it with your message.